To Cite: Ahmadi M, Hoseinzade A, Haghighi S, Yosefi S. Complex Partial Seizure and Hippocampus Atrophy Caused by Tramadol Abuse: A Case Study, Ann Mil Health Sci Res. 2017 ; 15(1):e61240. doi: 10.5812/amh.61240. Generalized seizure is known as a dose- independent side effect of tramadol. The presented case is affected by complex partial seizures, following tramadol dependency. Brain magnetic imaging showed atrophy of left hippocampus, compatible with mesial temporal sclerosis. Mesial temporal sclerosis is the most common cause of treatment- resistant seizure with etiology of trauma, inflammatory processes, and recurrent seizures. It seems that recurrent generalized seizure by tramadol abuse is responsible for hippocampus atrophy, mesial temporal sclerosis, and complex partial seizures. Tramadol, an analgesic agent, is an agonist of opioid receptors and simultaneously inhibits the reuptake of serotonin and norepinephrine. Tramadol is widely abused, so it seems that tramadol dependency is being progressively prevalent. Seizure is a non-dose- dependent side effect of tramadol, but non-focal or generalized seizures are the expected type (1). Here, a tramadol dependent patient is reported with complex partial seizure and atrophy of left hippocampus. To date, there has been no previous report on complex partial seizure or hippocampus atrophy associated with tramadol. The patient was a 20- year old male with recurrent seizures. Seizures’ recurrence was more than one time a day with maximum time length of 5 minutes. His seizures started 3 years ago. Specific odors or involuntary rhythmic movement of the neck and jaw before the seizures, and myalgia, or fatigue after the attacks were reported by the patient. He has previously had bizarre visual and auditory hallucinations and complained of memory loss and losing important things. However, he had no previous history of seizure, head trauma, or neurologic involvements. In addition to sodium valproate and carbamazepine, he had been using tramadol for 3 years (300 mg per day up to 6 month ago, which then, increased to 2000 mg per day). He did not use ecstasy and had no family history of epilepsy. Generally, he was confused mildly (not in postictal phase) but cooperative. He had delayed responses, and impaired long- term memory and concentration. Eye contact and smile response were observed. He was mildly depressed but not irritable. He had rare experiences of visual and auditory hallucinations in withdrawal phase. He had moderate miydriasis with normal light reflexes and normal cranial nerves. Extremities had tremor, muscles tones and forces were symmetric and normal, sense, gait, and equilibrium were normal. Deep tendon reflexes were symmetric and normal. To prevent trauma during seizure and observe seizure pattern, we closely observed him for about a week and provided him with neurological consultation. Seizures occurred one time a day or more with aura, tonic- clonic movements, postictal phase, and caused amnesia of the patient about recent events. Urine screening result for substances was negative. Electroencephalography was normal. Brain MRI, reported by three radiologists (blinded to patient), showed atrophic left hippocampus and loss of hippocampus interdigitations (abnormal morphology of hippocampus), mild prominence of temporal horn of the left lateral ventricle, and Sylvian fissure widening incompatible with patient’s age. The patient was treated by carbamazepine. Seizure frequencies were reduced in to one time a week after 3 months of treatment. He was consulted for treatment of tramadol dependency. MRI main cuts are presented in Figure 1. Figure 1. A, axial flair, widening of sylvian fissure and atrophy of temporal lobe; B, axial T2, atrophy of hippocampus and abnormal architecture; C, axial flair, atrophy of hippocampus and absence of normal interdigitation; D, coronal T2, loss of normal hippocampus (atrophy, loss of volume and absence of normal interdigitation), mild prominency of left lateral ventricle incompatible with patient’s age and rotation. Complex partial seizure causes memory loss with involvement of temporal lobe (2). Patients with complex partial seizure have impaired cognitive and executive functions (3). Our patient was complaining about memory loss and losing his important things. His long- term memory was mainly reduced but his short- term memory was also reduced. His responses about childhood history were delayed and not clear and at the same time he did not remember the time of neurologist’s visit. It seemed that his memory loss was affected by his mild depression, at least partially, but his long- term memory loss might be associated with hippocampus atrophy (4). Tramadol is an analgesic agent with dual mechanism. It is agonist of μ opioid receptors and inhibits reuptake of serotonin and norepinephrine (5). Generalized seizure is a known non-dose- dependent side effect of tramadol (6). Our patient had seizure after starting tramadol, 300 mg per day. At this stage, he had no aura, however, aura was present when the dose of tramadol was increased to 2000 mg per day. It seemed that generalized seizures were converted to complex partial ones by involvement of hippocampus, but the conversion is under question with unreliable patient’s memory. 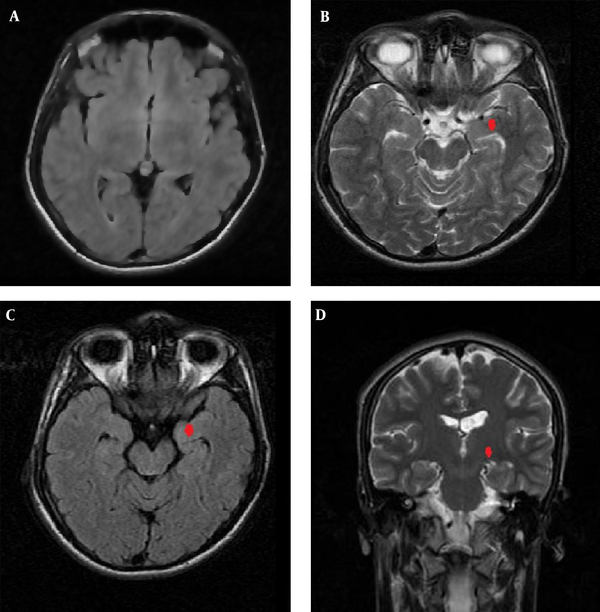 Notable atrophy of hippocampus in various MRI cuts with widening of Sylvian fissure, distention of the left lateral ventricle, and loss of normal architecture of hippocampus in the left side were suggesting mesial temporal sclerosis (MTS), the most common cause of drug resistant epilepsy (7). Main causes of MTS are traumatic brain injury, inflammatory process, eg, infections and recurrent seizure. To explain the possible association between tramadol and hippocampus atrophy, previously recurrent or prolonged seizures have been attributed to mesial temporal sclerosis (8). Tramadol is associated with lower threshold and higher rate of seizure (9). Another explanation is that there are evidences about association of tramadol with disorganization of neurons, apoptosis, chromatin changes, blurred nucleolus, intercellular edema, and capillary congestion in brain tissues. Tramadol also increases oxidative stress and cell damages with decreased non- enzymatic anti- oxidative activity, reduced glutathione peroxidase activity, altered glucose metabolism, and suppressed insulin signaling (10-12). There were no data on existence of MTS before tramadol abuse. Absence of previous traumatic or inflammatory process or seizure and atrophy, without prominent hyper signal lesion in MRI, were all suggesting that hippocampus atrophy was a recent event. In conclusion, hippocampus atrophy may be associated with tramadol abuse. The present case is preliminary evidence about association of tramadol with complex partial seizure. Considering an increasing abuse of tramadol, conducting further studies is highly recommended.